The Millennial Generation faces a multitude of challenges – cyber living and cyber bullying, global warming and global viral pandemics, obesity and emaciated social ties, political polarization and questionable political leadership. Our educational system focuses on improving overall rates of academic achievement. Challenges above are not likely to be resolved by academics alone. Immunization from these challenges is neither possible nor desired. 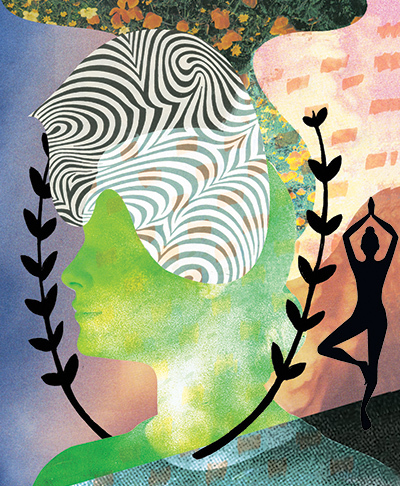 To deal adaptively with these universal life challenges, we need resilience. 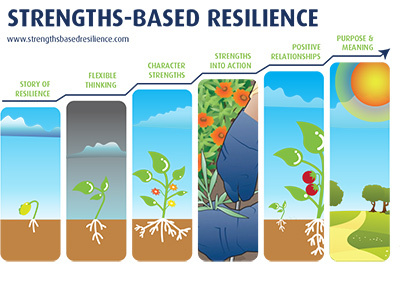 Resilience, however, is not only about mitigating these risk factors; it is also about enhancing resourcefulness. The Strengths-Based Resilience program is designed to help you develop resilience, defined as the ability to cope with adversity. The program invites you to reflect actively on your experiences that demonstrate various aspects of your resilience. By reflecting back on these experiences, and engaging in other exercises, you will learn skills and strategies to build your resilience. This program does not teach reading, writing or mathematics. It does ask you to try out new skills and learn who you are and who you want to be. Rarely in life will you will have such dedicated and structured time to conduct this sort of self-development. ◉ Do you view yourself through a lens of strengths or weaknesses? ◉ Which do you value: the traits you have or don’t have? ◉ Do you know which of your characteristics help you respond adaptively to a challenge? ◉ What kind of support do you need from your family, friends and teachers in order to meet various kinds of challenges? ◉ Who supports you the most through difficult times? ◉ Who do you support when they are facing a tough situation? We are grateful to the Ministry of Training, Colleges & Universities for their generous award through their Mental Health Innovation Funds (MHIF) awarded to first author (Principal Investigator) and the University of Toronto Scarborough (UTSC). We are also grateful to our institutions’ support for this endeavor. University of Toronto Scarborough (UTSC), where the first author works as a licensed clinical psychologist, supported the editing and organization of the current Spring 2016 version. Toronto District School Board, where the second author works, supported initial validation studies at its schools. Executive and administrative support from TDSB has been instrumental in advancing this project. The Strengths-Based Resilience program is designed to help you develop resilience, defined as the ability to cope with adversity.